Big news outlets stupidly sold their soul to Facebook. Desperate for the referral traffic Facebook dangled, they spent the past few years jumping through its hoops only to be cut out of the equation. Instead of developing an owned audience of homepage visitors and newsletter subscribers, they let Facebook brainwash readers into thinking it was their source of information. Now Facebook is pushing into local news, but publishers should be wary of making the same crooked deal. It might provide more exposure and traffic for smaller outlets today, but it could teach users they only need to visit Facebook for local news in the future. Here’s how Facebook retrained us over the past 12 years to drain the dollars out of news. To be clear, Facebook’s intention, that I believe to be earnest, is to foster stronger ties between its users and their communities to boost well-being. But that doesn’t mean ripple effects are positive. The critical lens through which to view all of Facebook’s strategy is that in the short term it puts users first, itself second and everyone else a distant, distant third. That includes developers, advertisers and definitely news publishers. This strategy is actually self-serving in the long term, though, because Facebook only continues to dominate because its users don’t leave. Back in 2010, Facebook decimated the virality of game developers like Zynga, which made lots of money because their News Feed spam threatened to push people away from the social network. That short-term hit to the bottom line paved the way for the depth of engagement that fuels quarters where Facebook earns $4 billion today. This explains CEO Mark Zuckerberg’s recent announcement that Facebook would make changes to enhance well-being even if it decreased time spent on the site or its ad revenue. Those consequences may be true in the short term. But it’s a shrewd tactic when you zoom out. Left unchecked, the “Time Well Spent” movement could metastasize into a “Time to leave Facebook” movement. Better to trade away a few minutes per day per user now to keep those users for years to come. When Facebook started, there was no feed. You browsed from profile to profile to check up on friends. News Feed’s launch in 2006 retrained users to just go to the Facebook home page where everything would come to you. Brands followed, investing to build an audience through Facebook’s churning stream of content. As Facebook’s users shifted from PCs and Macs to Androids and iPhones, the company struck upon an enduring format for mobile. Desktop computers had big enough screens to accomodate multiple windows, and switching between browser tabs was quick, allowing users to easily hop between different sites. But on mobile with tiny screens, low quality app, poor connections, slow-loading sites, people seized upon Facebook’s single app that pulled together content from everywhere. Facebook began to train us to keep scrolling rather than struggle to bounce around. In 2011, when Facebook first took notice of Twitter, it launched its public figure Subscribe feature and news links gained more visibility in the feed. By 2014, “Facebook the big news machine” was in full swing with Trending, hashtags and news outlets pouring resources into growing their Pages. Emphasizing the “news” in News Feed retrained users to wait for the big world-changing headlines to come to them rather than crisscrossing the home pages of various publishers. Many don’t even click-through, getting the gist of the news just from the headline and preview blurb. Advertisers followed the eyeballs, moving their spend from the publisher sites to Facebook. In 2015, Facebook realized users hated waiting for slow mobile websites to load, so it launched Instant Articles to host publisher content within its own app. Instant Articles trained users not to even visit news sites when they clicked their links, instead only having the patience for a fast-loading native page stripped of the publisher’s identity and many of their recirculation and monetization opportunities. 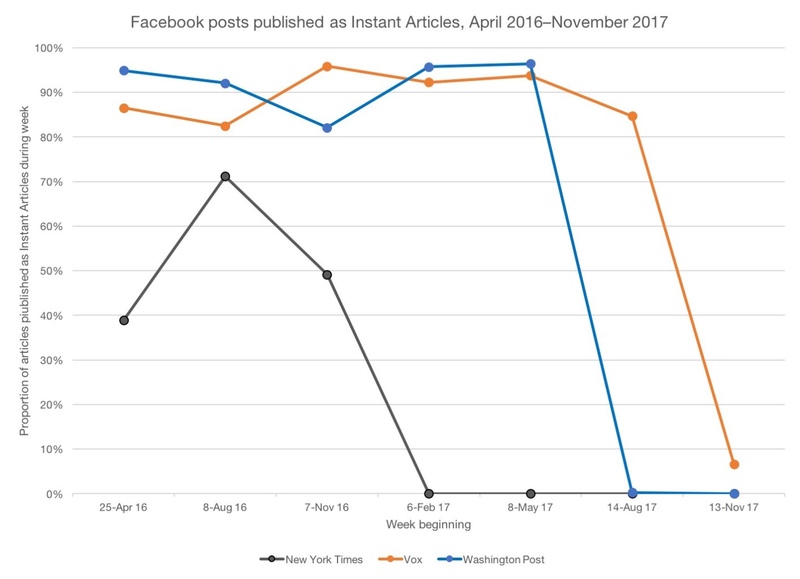 Advertisers followed, as publishers allowed Facebook to sell the ads on Instant Articles for them and thereby surrendered their advertiser relationships at the same time as their reader relationships. Publishers wisely began pushing back, demanding more layout and monetization flexibility, and many abandoned the platform in favor of Google’s less prescriptive AMP platform for fast-loading mobile pages. In fact, 38 of 72 Instant Articles launch partner publications including the New York Times and Washington Post have ditched the Facebook controlled format according to a study by Columbia Journalism Review. Still, publishers have few major sources of traffic outside of Facebook and Google Search. With the death of Google Reader and Twitter’s move to an algorithmic feed, there’s still no at-scale, unfiltered place to share or follow news. If people do want a more direct relationship with news, they should get on Feedly or another RSS readers, or add a few favorite sites to their browser’s bookmark bar. Meanwhile, Facebook’s only goal remains to provide value to users, and when it comes to content, it doesn’t really care which publisher provides it as long as it’s high-quality. Again and again, Facebook has centralized attention typically spread across the web. A few years back I wrote about “20 New Ways Facebook Is Eating The Internet,” and its appetite has only grown. It’s trying to do the same with Watch (YouTube), Marketplace (Craigslist and eBay) and many other features. It’s a smart plan that ends up arguably improving the experience for individual users — or at least offering new options while making Facebook more essential and much richer. The problem is that for society as a whole, this leads to a demonetization and eventual defunding of some news publishers, content creators and utility providers while simultaneously making them heavily reliant on Facebook. This gives Facebook the power to decide what types of content, what topics, and what sources are important. Even if Facebook believes itself to be a neutral tech platform, it implicitly plays the role of media company as its values define the feed. Having a single editor’s fallible algorithms determine the news consumption of the wired world is a precarious situation. The business side is just as troubling. As Ben Thompson of Stratechery has described, advertisers are abandoning news sites and aggregating to Facebook where they can more efficiently target their exact customers, where they go every day. Why advertise on an intermediary news site when businesses can go straight to well of attention. Without the massive scale and adtech, individual publishers can’t compete for dollars. But if they resist working with Facebook and providing their content there, another publisher will happily bring the same stories to the social network in return for the short-term traffic boost. There’s always someone else willing to offer up dumb content to the smart pipe. And the real problem only manifests when Facebook shifts directions. Its comes to the conclusion that users want to see more video, so the format gets more visibility in the News Feed. Soon, publishers scramble to pivot to video, hiring teams and buying expensive equipment so they can blast the content on Facebook rather than thinking about their loyal site visitors. But then Facebook decides too much passive video is bad for you or isn’t interesting, so its News Feed visibility is curtailed, and publishers have wasted their resources and time chasing a white rabbit… or, in this case, a blue one. This happened to Page tab apps like musician profile provider BandPage, which was the No. 2 app on Facebook until Facebook banned default landing tabs. The startup lost 90 percent of its traffic after wasting years chasing Facebook’s changes, and eventually sold for $8 million after raising $27 million. Open Graph news reader apps met the same fate, built by publishers to meet the opportunity of Facebook’s short-lived Ticker and “Josh read [clickbait article] on Washington Post Social Reader” stories. Publishers are currently caught amidst of another massive Facebook strategy change. It’s now striving to offset Russian election interference, fake news for profit, allegations of political bias, polarized society, the explosion of viral video, the absence of friends, and fears that too much scrolling hurts our well-being. That’s led to Facebook proclaiming it will remove 20% of news from the News Feed as it prioritizes content that’s not just meaningful, but stimulates meaningful interactions between users. On this week’s Q4 2017 earnings call, Zuckerberg said Facebook had already tweaked its algorithm to show fewer viral videos and optimize well-being. The result was a 50 million hours per day reduction in Facebook use, which translates to 2.14 minutes per daily user, or 5 percent of total time spent on Facebook. The company was willing to go so far as to make changes that led to its slowest ever user growth rate, and its first decline in total users anywhere as the U.S. & Canada region actually lost 700,000 Facebookers. Yet it’s the video makers and news publishers who will pay for this pivot of purpose. Facebook’s revenue still reached a record $12.97 billion, and investors still boosted its share price higher. In fact, Facebook could actually earn money or at least break even from the “Time Well Spent” changes. By decreasing total time spent but raising the quality of content people see, Facebook ends up with fewer total ad impressions but higher engagement rates as people are retrained to skip less of what they see. Advertisers still eager to reach its massive audience will compete in Facebook’s ad auctions, paying higher prices. Facebook has the cash reserves and momentum to weather the short-term monetization drop in exchange for a healthier long-term future. Content creators are left trying to make ends meet. And now local news site are facing the start of this dangerous cycle. Facebook says it will show more local news in the News Feed. It’s testing a “Today in” local news digest in several cities. It’s prioritizing content people discuss instead of passively consume. And Facebook is pushing its new mission to rebuild communities and Bring the World Closer Together that aligns with local news. Sounds great, right? There’s no doubt there’s an opportunity here for local news outlets. But the key to keeping their boats afloat is not completely changing course to follow Facebook’s siren call. Whether or not you think the company is purposefully trying to destroy the industries it invades or just modernize them to benefit users, publishers must meet Facebook with skepticism. Facebook’s next retraining appears to be that it’s the best place to get local news, not your local newspaper or blog. It might happily display all the headlines with little encouragement for readers to click through, as it does with Today On. It might make images and videos load faster than they do on local sites. And they might bundle local news with Facebook Events and reviews of nearby places using personalization local sites can’t match. That might be good for the reader, and thereby for Facebook long term, but it’s dangerous for the publishers. Facebook doesn’t even have to purposefully poach advertisers from local sites, they’ll just flow to it naturally as it becomes the local news destination. They should still focus on turning occasional readers into repeat homepage visitors that bookmark the site and return frequently. They should track analytics about what kinds of stories those loyalists want, rather than the ones that might drive occasional traffic spikes of fly-by readers. They should invest in developing their own ad technology or partnering with more neutral third-party providers. And they should keep pushing email newsletter, event and subscription signups. That’s because there’s no telling when Facebook’s strategy around what users want or how to give it to them will change. Again, Facebook wants users to be informed and entertained, but it doesn’t necessarily care how or by whom. And let’s not forget that Facebook is quietly building up its Marketplace peer-to-peer selling feature in another part of its app to be the ultimate replacement for the classified ads that used to keep local news sites afloat. Unfortunately, big, well-funded publishers staffed with true tech talent haven’t been able to gracefully navigate the constantly changing playing field set by Facebook. So what hope do smaller outlets without the technological or strategic prowess hope to have? In Zuckerberg’s hometown of Dobbs Ferry, NY, there’s a beloved newspaper called The Rivertowns Enterprise. It’s a destination for those seeking local news, with a loyal following for both its website and its weekly print edition, which many who grew up there get delivered to their homes around the country. Visit its site and you’ll stumble across a variety of stories about city politics, high school sports and Main Street businesses that also advertise there. But as Facebook turns its eyes toward local news as an answer to larger problems with well-being, false information and polarized communities, it also poses a threat to The Rivertowns Enterprise and outlets like it. The inevitable march of technological progress was merely accelerated by the dominant social network. But for now those publishers’ best bet is to take a page from Facebook if they’re going to survive: Put your own readers and your long-term viability first instead of gambling on short-lived favors.